Hello viewers! I appreciate your patience and your continued interest in our film. Since it has been quite a while since an update, it is time to share some details on what’s happening with the film right now. Making a feature length film has lots of challenges, and they don’t end when the cameras stop rolling. We’re not here to offer excuses, only the news that the project is still well under way and we are hard at work editing the film. There will be a new trailer and some behind the scenes footage coming over the next few months. Please be patient. We can’t promise any release dates but we’re damn near sure that this film will be completed in 2013 barring any cataclysms, nuclear warfare, and/or alien attacks. Go watch our new trailer once it’s out, post on any forums you frequent, let your friends know, join our Facebook group, and comment and/or e-mail to let us know you’re still interested. If we’ve let you down because of the delay, we don’t blame you. All I ask is that you give us a fair shake and watch the film once it’s done. It is shocking how much damage the mountain bikers have done to North Vancouver’s forest environment. 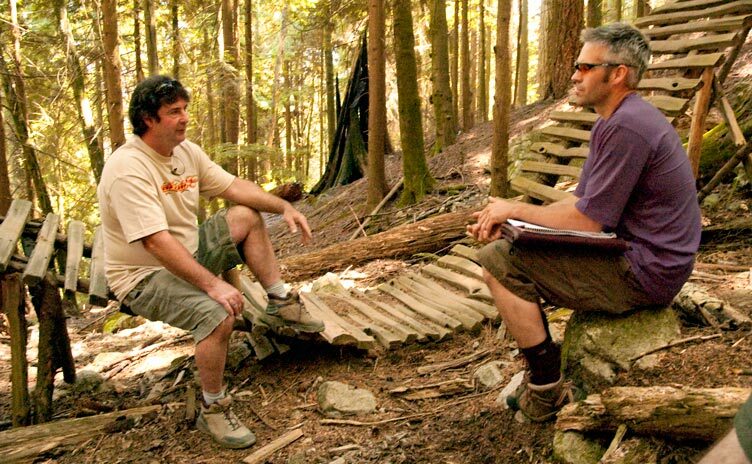 Since your filming began almost five years ago, the forest you filmed vs. the forest we see today would almost be unrecognizable for all the new trails and ride structures the bikers have built inside it, legal and illegal. Both the riding and the trail building can only be categorized as an obsessive-compulsive addiction. It is never ending. The Diagnostic and Statistical Manual of Mental Disorders (DSM-5) will have to add “Mountain Biking” into their manual by the sixth edition. The mtb trail diggers are worse than beavers and moles with their insatiable appetites!